2) Caption the button. Buttons can have captions preceeded with the ampersand ("&") character, which in turn acts like a shortcut when used in combination with the Alt key on the keyboard. As a personal choice, I captioned the button with &4, as the expansion button is Expansion Button 4. 3) In addition, we can change the button's Visual properties to blend it in with the expansion button. I particularly prefer to stack these shortcut buttons on top of or next to the expansion button they will serve as a shortcut for. 4) The button can then be added to VBA where code can be written to force the execution the expansion button Change script. To run the Expansion Button 4 change script that will open the window, we use the Dynamics Continuum Integration library and pass-through Dexterity Sanscript. Commands = Commands & "run script 'Expansion Button 4' of window POP_PO_Entry of form POP_PO_Entry;"
You will need to add the expansion button to VBA in addition to the pixel size button for the above code to work. Very simple! 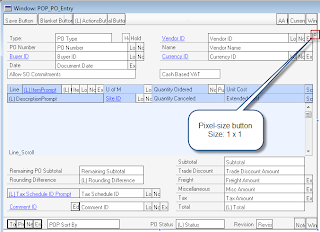 Now when you go to the Purchase Order Entry screen, enter PO number and select a vendor, you can press Alt + 4 on the keyboard to open the associated window to the Vendor ID expansion button. Hope you find this sample project useful. 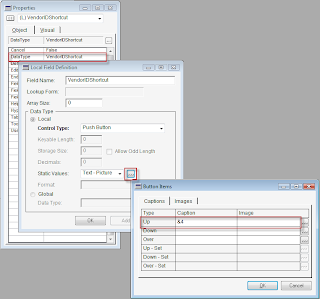 v10 - Sample Expansion Button shortcut package file - click here.